Wicked Wonderful Words: Review: "Horns"
I don't know how to explain what type of book "Horns" by Joe Hill is - I can't really think of any other books quite like this one. It is really different from most other books that I have read and I had no real expectations when I started to read it. I had read a decent review of it, thought the plot sounded interesting and wanted to give it a go and so I did. Joe Hill, the author, has a bit of a parental heritage to live up to as he is the son of no other than Stephen King and I have to say that probably that is where my only real expectation came from. I somehow expected the book to remind me of Stephen King and I am happy to report that it didn't though I know that some readers disagree with me on that one. Joe Hill has his own voice, his own language and style so even though the plot sounds like something that King could have thought up, it is treated in a way that is all Hill. Love it. 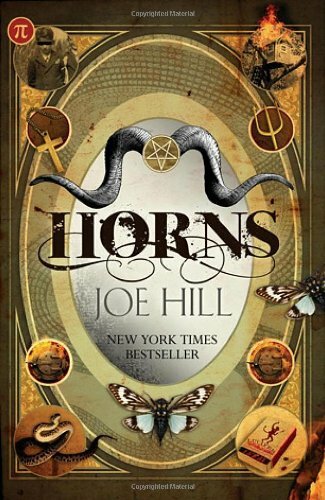 The main character of "Horns" is Ignatius William Perrish, Ig, is a normal guy at least in his own eyes and at least until the day he wakes up with... horns! Out of nowhere he has grown a pair of horns that doesn't only make people stare but also makes them divulge all of their secrets. From the embarrassing to the downright evil and cruel ones. Suddenly Ig finds that the people he thought he knew are very different from the way he perceived them and that the people he thought he loved maybe don't love him. It is a rough awakening. Especially because the horns reveal what Ig really doesn't want to know - they everybody think he killed his ex-girlfriend, the only girl he has ever love and the only real good thing in his life. I won't say much more about the plot here because I don't want to create spoilers or reveal too much. What is so great about this book is that it manages to combine the serious and the humorous in a very elegant way. Ig, who is already shut more or less out of society due to the suspicions that everyone have about him, become completely shut out yet gets a much better understanding when he grows the horns. Suddenly he is able to see the most vile sides of humans and this means that he gets completely new perspective on everything that happens around him. The love story part is touching and the ending was amazing - I feared that the ending wouldn't live up to the plot but it did, it more than did. However, the book is so funny. There are a lot of scenes that made me smile and laugh - Ig's family is horrible, really horrible. Especially his grandmother! Ig himself is great as a main character because even though he is flawed and even unkind at times, especially when it comes to girls, he is very easy to feel sympathy for and to like. Read it if: You liked Mikhail Bulgakov's "The Master and Margarita" or loves the Rolling Stones' "Sympathy for the Devil".